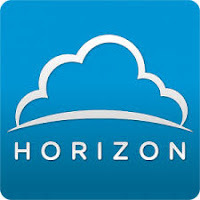 Today, I want to talk about one of my favorite products in the Horizon Suite, Mirage. VMware Mirage provides several capabilities to physical workstations and persistent virtual desktops. 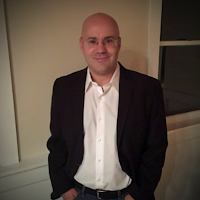 These capabilities include centralized image management through logical layers. Endpoint protection with desktop backups to network storage on an hourly basis that has daily, monthly, and yearly snapshot recoveries. And finally, one of the most critical aspects for the 45% of companies that haven't moved to Windows 7, an automated migration from Windows XP to Windows 7. Don't forget, on April 8, 2014 there will no longer be patches deployed to one of the most porous operating systems. In order to get patches, you need a $500,000.00 support contract with Microsoft and each patch is $50,000.00. 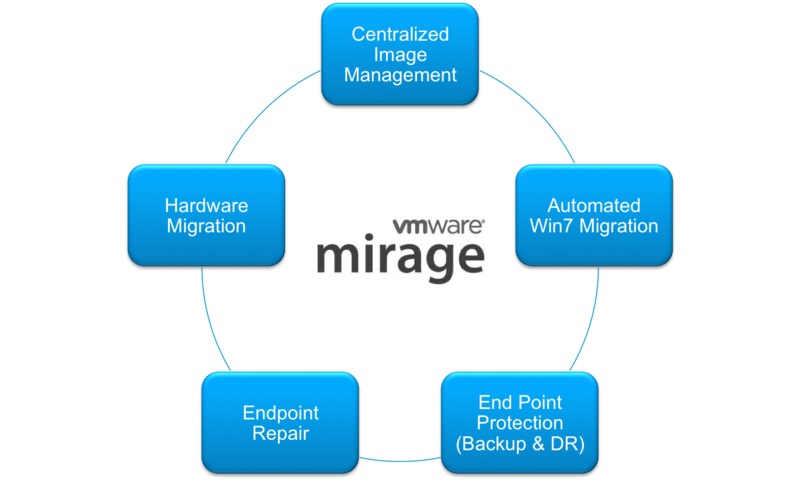 Overall, VMware Mirage provides centralized management capabilities for physical desktops similar to the way VMware View provides centralized management for virtual desktops. The goal is to lower the amount of operational support provided by your end user computing IT professionals by centralizing device management in the datacenter. Additionally, you will be delivering enhanced capabilities to your business partners. 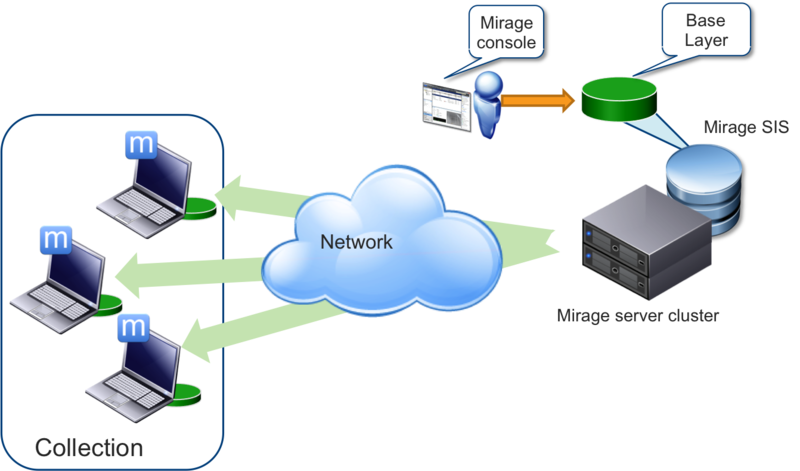 After you install the Mirage client on an endpoint device and register it with the Mirage server, it starts to backup the endpoint. Because Mirage uses deduplication and compression, network traffic is minimized and storage for each client is typically between 10 to 15 Gb in the data center. Deduplication is done at the file, chunk, intra-file, and inter-file level. Full desktop indexing ensure that only changes are sent across the network to storage, and a global shared index further improves transfer efficiency. Mirage tracks desktop changes for automatic synchronization when connected to the Mirage server, and shows an indicator for files pending synchronization. Furthermore, users can download missing files on demand. 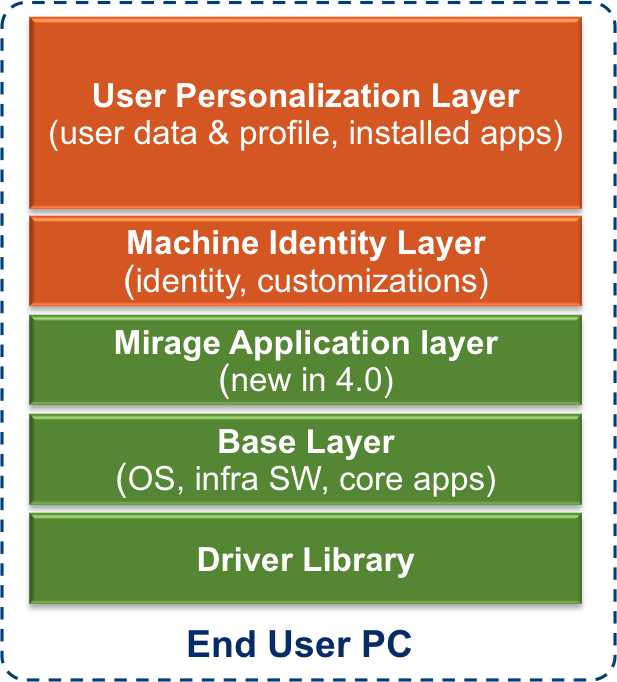 Mirage breaks up a centralized virtual desktop (CVD) into logical layers. 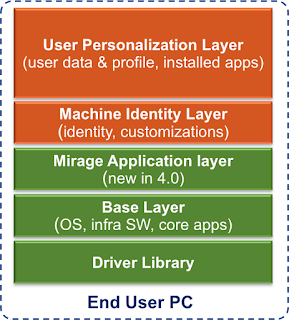 There are five main layers, the layers in orange always initiate from the end user device, these are personal settings, files, and user installed applications. 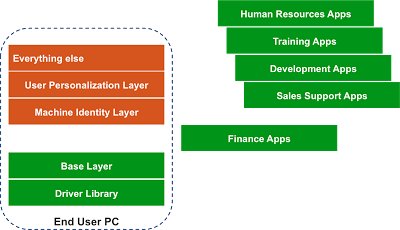 The three layers in green can originate from the end user's device or the IT department. The IT infrastructure team creates a Base Layer image and the Driver Library which are deployed out to the clients, the endpoints are then centrally managed and data applied from the data center. If the IT infrastructure team doesn't manage the device with a Base Layer, the endpoint will be stored on the network storage in the data center as-is. Base layers should be very thin, the lowest possible configuration for 90% of your user population. It should be the operating system, infrastructure support applications (firewall, antivirus, application deployment tools, and monitoring tools), and software common to the entire corporate user population. 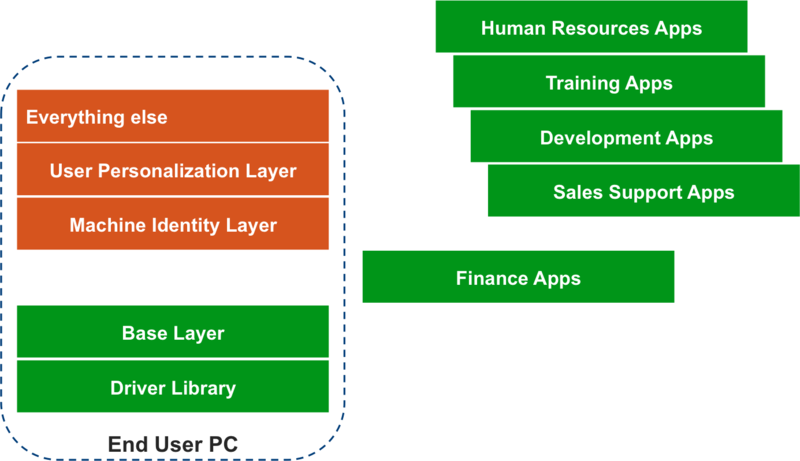 You would use the application layers for more specific department or user population needs. One thing to keep in mind, Mirage cannot distribute encryption systems which require partition or boot sector modifications. 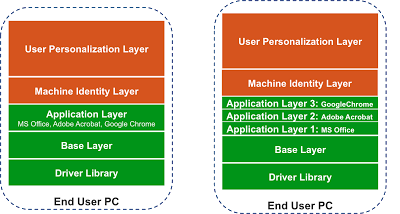 Application layers can be delivered as a complete bundle or multiple layers for each individual application. 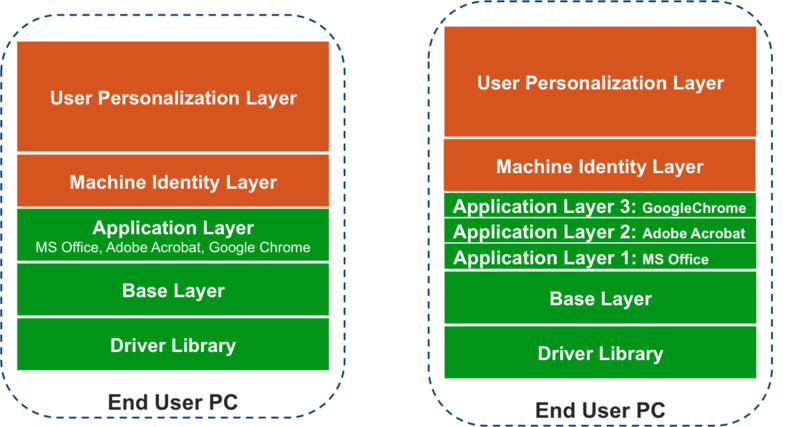 If you bundle your applications, you can make application layers specific to different departments in your user environment. These could include finance apps, sales support apps, development apps, and human resource apps. When you couple in the Drive Library, you are able to deploy a single base image to multiple client devices from different hardware vendors and virtual desktops with specific department applications. This makes management of endpoint devices dramatically easier and significantly lowers the cost of operations. In my next post, we will talk about the Windows XP to Windows 7 migration feature in VMware Mirage.